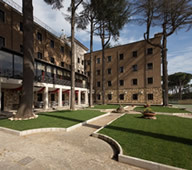 The Regal Park Hotel Rome is a 4 star hotel that has something for everyone. One of the reasons for this versatility is its idyllic location that blends the tranquility and beauty of the countryside with the easy access to the history and culture of the ancient city of Rome. 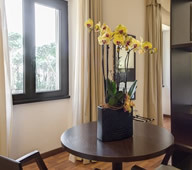 Indeed, our hotel is just 300 metres from both the train station taking guests directly to the Vatican, Sistine Chapel, Trastevere, the Coliseum, Termini Station & the airports beyond; and the Isughereta Natural Reserve. Set on the famous Via Cassia amidst wonderful natural parks and between the enchanting Lake Bracciano and Rome, the Regal Park Hotel Rome is a perfect setting for wedding venues, gala banquets, business meetings and conferences. Guests joining us by car will find us close to the great ring road that encircles Rome and our free private parking means that travel by car couldn’t be easier. Nevertheless we also offer a shuttle service for a surcharge if you prefer. Simply make your booking today through this – our official site – and make sure you don’t miss out on this great opportunity. The panoramic views from our expansive terrace and cultivated gardens are the perfect backdrop to cocktail parties, receptions and aperitifs. The medieval and enchanting streets of Trastevere Testaccio and the B line of the underground which takes guests to Circus Maximus, the Coliseum and the Basilica of St Paul to name but a few destinations Termini station with direct links to both of the city’s main airports as well as rail links to the rest of Italy and indeed Europe. If, after a hard days sight-seeing you would like to relax in the tranquil countryside then guests to the Regal Park Hotel Rome can do just that with a host of walks, bicycle rides, views and golf courses within easy reach. If travelling by the more direct comfort of train is more your style however then you will be pleased to learn that from the nearby La Giustiniana train station guests are taken directly to: The Basilica of St Peter, the Vatican Museums, the Sistine Chapel and Castel Sant’ Angelo. From there, one can also join the metro underground line A at Ottaviano and be moments away from Piazza del Popolo, the Spanish Steps, the Trevi Fountain and the papal Basilica of St John Lateran.